In an effort to educate the public about the need for the blood component known as platelets, the South Texas Blood & Tissue Center has launched "Platelet Power." 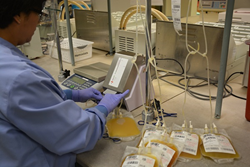 A laboratory technician processes platelet donations at the South Texas Blood & Tissue Center. Platelets have a very short shelf life, just five days. That means they’re always in high demand. Every day of the year, people need the blood component known as platelets. The problem is that platelets have a very short shelf life, just five days. That means they’re always in high demand, which is why the South Texas Blood & Tissue Center (STBTC) has launched a campaign to educate the public about platelets and encourage donations. “Platelet Power” includes the release of a series of informational videos about platelets. The videos are in a playlist on the YouTube channel for BioBridge Global, the parent organization of the STBTC. The videos were released during an internal Platelet Power campaign at BioBridge Global, and all platelet-related materials on social media carry the #PlateletPower hashtag. The campaign will be carried over to STBTC blood collection drives at all seven fixed donation sites, as well as mobile drives using buses specifically designed for platelet collections. The effort began in January. An email encouraging platelet donations will be distributed to donors throughout South Texas, and a page on the South Texas Blood & Tissue Center website explains the donation process and includes details on the science of platelets. STBTC can extract the platelets from a regular whole blood donation, but it takes approximately six of those extracted platelet components to make a full treatment for an adult. A platelets-only donation normally supplies a complete dose of platelets for an adult patient. The typical platelet donation takes approximately two hours from initial sign-in to completion, compared to an hour for a whole blood donation. All collection sites, including the mobile centers, are set up so donors can relax and enjoy a movie during their donations. Platelet donors need to be at least 17 years old and weigh at least 110 pounds. About the South Texas Blood & Tissue Center: The South Texas Blood & Tissue Center (STBTC) is a nonprofit community blood center providing blood, plasma, platelets and other blood components to 67 hospitals in 43 South Texas counties. STBTC has seven donor rooms in South Texas and conducts multiple mobile blood drives each week. Learn more at SouthTexasBlood.org. About BioBridge Global: BioBridge Global (BBG) is a San Antonio, Texas-based nonprofit corporation that offers diverse services through its subsidiaries – the South Texas Blood & Tissue Center, QualTex Laboratories, GenCure and the Blood & Tissue Center Foundation. BBG provides products and services in blood resource management, cellular therapy, donated umbilical cord blood and human tissue as well as testing of blood, plasma and tissue products for clients in the United States and worldwide. BBG is rooted in the South Texas Blood & Tissue Center, which has a proud history of serving the South Texas region and beyond for more than 40 years. BBG is committed to supporting groundbreaking research, addressing unmet clinical needs and enabling the development and commercialization of novel biotechnology products. Visit us at biobridgeglobal.org.